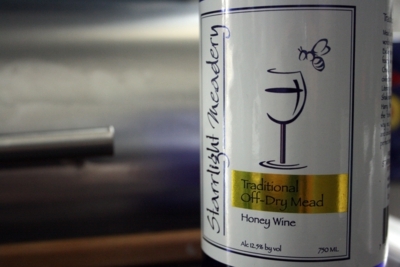 Mr. Gourmez’s first, and only, thought on this honey wine from Starrlight Meadery in Pittsboro, was “popsicles.” I would disagree. It smelled like green apples and tasted, unsurprisingly, of honey and flowers. This is a dry mead, so it wasn’t nearly as sweet as I’d expect from a regular mead, but that honey smoothness shone through without being cloying. The green apple was definitely the prominent note with vanilla and butterscotch in supporting roles. Even with too much green apple in my wine of late, I found this a simple and refreshing change from grape wines. Will drink again, and merrily. No Other Bloggers’ Thoughts were found.